This recipe can be yours by kickoff, I promise! As you know, I’m participating in the awesome Foodie Football Friends blogger roundup. This month we were challenged to come up a team themed recipe – let me tell you thats not as easy as it sounds! 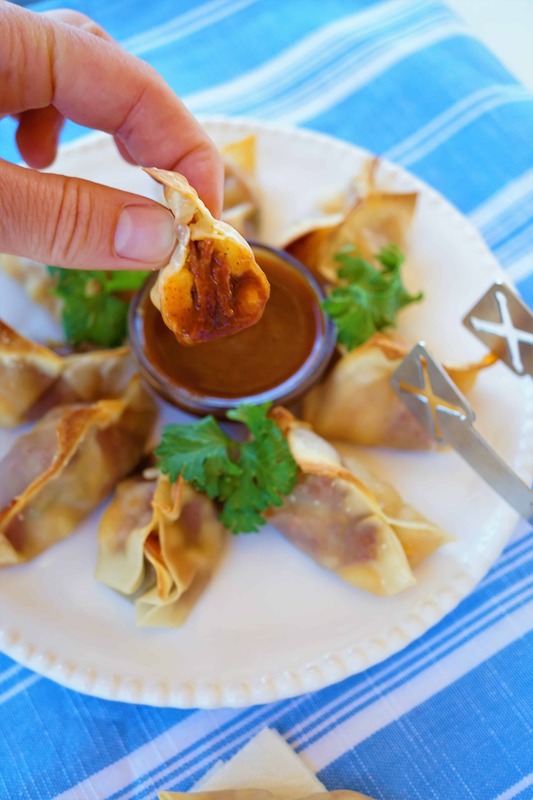 To be honest, this recipe came to life because I had a strong desire to use WONTON wrappers. After pinning just about everything in sight an epiphany happened. 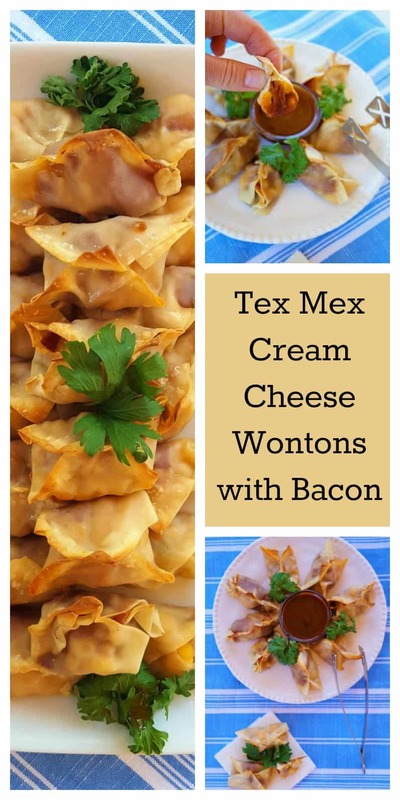 Enter – the birth of the Tex Mex Cream Cheese Wontons with Bacon! I can promise you, these are 100% delicious! I conducted a taste test at a friends birthday party and I don’t lie, these were #gonein60seconds!!! The beauty of these is that they’re healthy too. Yep, made with light cream cheese, turkey bacon and delicious and nutritious hominy, you get a satisfying bite of all those goodies in an oven baked pocket. #winning, I know! Hominy is a dried corn kernel that has been soaked in a solution that allows it to increase in size. This process also creates higher bioavailability of certain nutrients, like niacin and fiber. Now, I’m fairly certain you’re not considered about fiber on your #gamedayeats, so just make these with a smile and rest easy knowing you’re doing your body good! 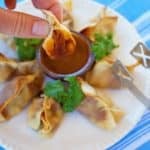 Tex Mex Cream Cheese Wontons with Bacon are the perfect appetizer to whip up and bring to any party. Flavorful, filling and oh so delicious, everyone will be grateful for you! In a large skillet over medium-high heat, heat oil and add in diced bacon. Cook 5 minutes and add in the hatch chiles and red onion. Cook another 3 to 5 minutes, or until onions are translucent. Add in garlic and stir. In a medium bowl, add the drained hominy, softened cream cheese and spices, stir. Add in the bacon mixture and stir again. Separate wonton wrappers on a large cutting board and line a baking sheet with parchment paper. Assemble wonton by placing 1 teaspoon of mixture onto the center of each wonton paper. Place your fingers in water and gently glide your finger along the side of the wonton wrapper. Fold up the sides into your desired shape and set on baking sheet. Continue until mixture runs out (about 36 wontons). Lightly brush tops of wontons with remaining 1 teaspoon oil. Bake for 18 to 22 minutes, or until tops are golden brown. Enjoy with dipping sauce of choice! 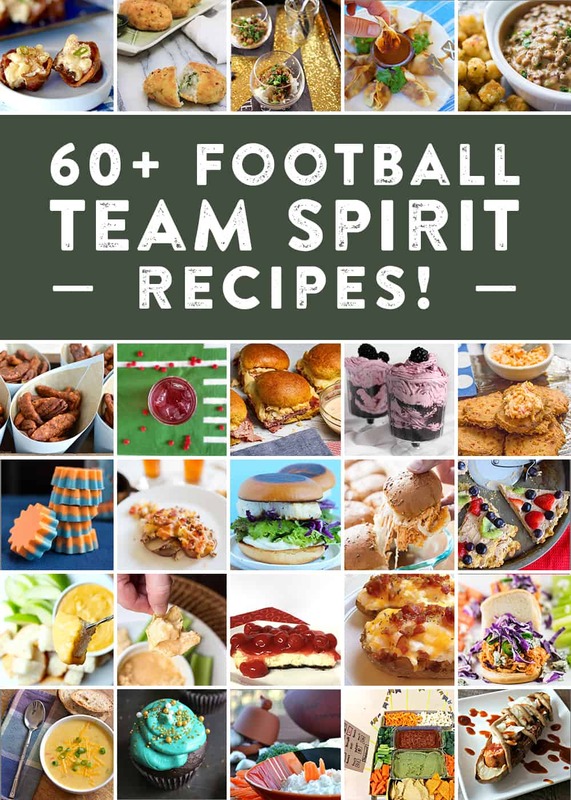 Be sure to check out the other Team Themed Recipes below too! Oh yum, yum, yum! 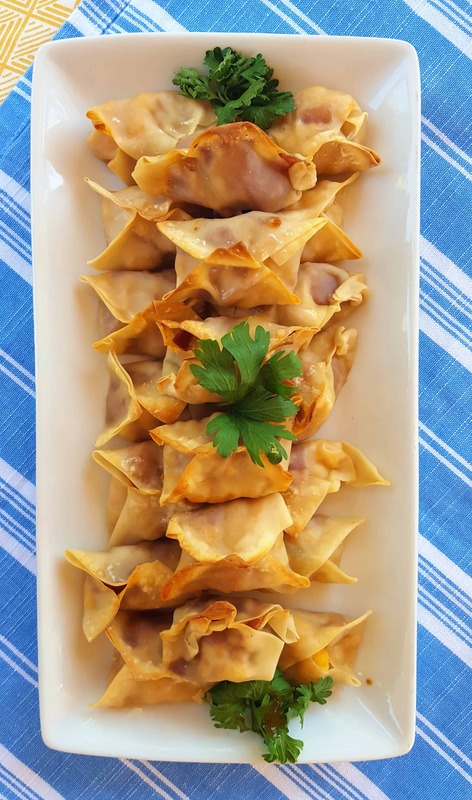 These scrumptious little bites remind me of crab rangoon which are one of my all-time favorite apps!! The wontons sound amazing! Cant go wrong with bacon and cheese. And what a surprise to see all these other great (60+) eats! Thanks so much Lauren!! I am so glad you like them! Yahoo! I love that there’s hominy in these! Yum! Oh YUM – I need these in my life!! 🙂 I hope you get them soon! I love hominy!! But then again I Love all the ingredients you used in these! Super yum! Thanks girl- I’ll be sure to whip these up next time you are out West!